By Robert M. Penna, Ph.D.
What goes in must come out, or so the old saying has it. But when it comes to our nonprofit programs, what, exactly does go in? This is something worth considering for a moment. Usually, we refer to the things that go into a system as inputs. They are the things that, through the system’s process, are turned into outputs. Seems simple enough. If we were making a cake from a box mix, for example, the inputs would be the mix itself, and the oil, eggs, and water the directions call for. Again, simple. The problem for nonprofit organizations, however, is that in our world things are rarely that simple. 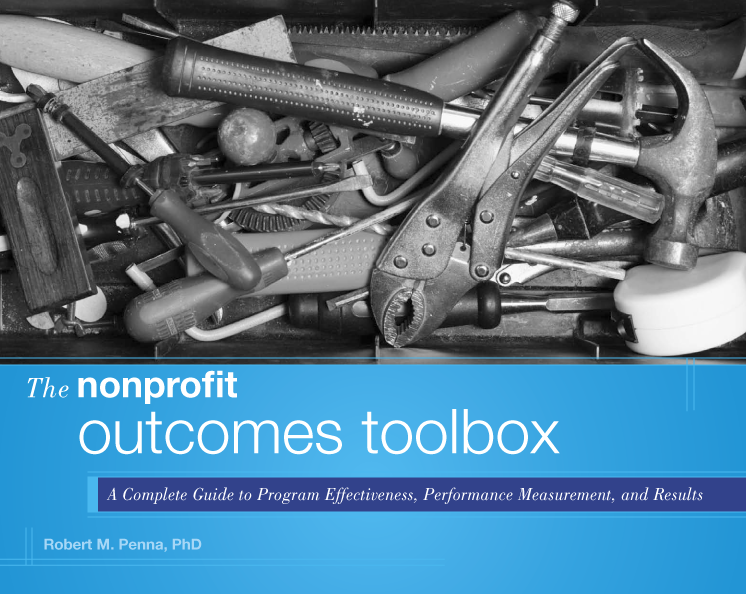 Generally, when asked about program inputs, nonprofit practitioners give answers like, “staff and money.” While these two considerations are important, a response boiled down to just these two elements overlooks important considerations that could impact the effectiveness of a program and its chances of success. An insight into this can be found if we change our example from making a box cake to something like standing on a dock and tossing a rock into a lake to create a splash in the water. Now if you think about it, it seems simple. We can all envision it. Rock in hand…arm cocked back. The toss, the arc, the splash. So what would be the inputs in that scenario? Most people would say the rock and the person tossing it. But is it that simple? The rock could be large or small. It could be round, hard, and smooth, and therefore aerodynamically sound, or it could be a jagged piece of a softer rock, whose many tiny facets and edges would create minuscule-but-measurable wind drag and shorten its flight. And the person tossing the rock, what about him or her? Is he a tall guy with long arms for a better launch, or a shorter or younger person with less arm strength? Does this person have experience throwing a ball which might translate into a better toss, or is it someone who has hardly ever thrown a ball before? What about technique? Was the rock tossed from a stationary, flat-footed position, or did the person use a baseball pitcher’s wind-up or even a cricket bowler’s running approach? The list of possible inputs affecting the quality of the toss, the distance the rock traveled, and the size of the splash it made goes on. It could include the weather (the rock will travel less far in muggy, humid weather), the wind (wind blowing into the thrower or away? ), the dock (was it steady giving the thrower a solid base, or wobbly and offering little support? ), even the altitude (think of all the home runs hit in the thin air of Colorado’s mile-high Coors Field). While it is true that each of these variables has an infinitesimal individual impact upon the rock, they are all nonetheless all measurable, and combined could have a noticeable negative influence. So it is with our programs. The inputs are generally far more complex than a simple combination of “staff and money.” There is the quality of the staff to be considered, their training, and even individuals’ suitability for a certain role. There is location to be considered, not just in terms of geographical place, but also in terms of the facility itself and its physical appeal. Scheduling can also have an impact. We all want our programs to be the best they can be, to have the most beneficial results for those we serve. But in order to accomplish this, we have to make sure that all the parts of the system we offer are suited to the task at hand and working in combination as they ought to. One way to help ensure that this happens is to take a closer look at the full range of inputs that go into our efforts. Because the old saying is true, what goes in does come out…and there are often more things going in than we might have realized. can a charity that makes funding available claim output (outcome, impact)? or can output (outcome, impact) only be claimed by the organisation at the receiving end? because the latter transforms input (charity’s grants) into output (outcome, impact). The first thing I’d say is that we need to be clear about our terms. An output is something an organization does. So, trainings or counseling sessions, classes, white papers…even meals, clothing, and medicines, are ALL outputs. Outcomes, by contrast, are what happens, what changes occur in the targeted situation, because of what an organization does. As for results or impacts, these are what happens because of the outcomes. So, for example, if an organization provided immunization shots against childhood diseases in certain villages in Africa, the shots are an output. Children not getting sick and therefore being better able to attend school would be two outcomes. Those kids doing better in school, or getting a better education as a result of their uninterrupted participation and attendance would be the results or impacts. It is important to remember that these terms are not interchangeable, and outputs are not, as your note implies, either outcomes or impact. In this case, where an organization makes financial resources available, that funding, whether a grant, a subsidy, or other pass-along of dollars the organization has gathered, is an output. The recipient organization, by contrast, if it is able, through the money it receives, to put in place a program or an intervention that makes a meaningful, measurable, and sustainable change in the target situation, can claim an outcome. Funding organizations need to be very careful about claiming as their own the outcomes of entities to which they provide financial resources. This is a common challenge for foundations. They provide (some of) the money that makes certain outcomes possible…this is true. But the actual beneficial outcome came about as a result of the work of the recipient organization. The connection is there, but it has to be carefully claimed.